The plant pictured above is a specimen representative of the Anthuriums known as "Birdsnest Anthuriums". The different species hybridize naturally so readily that determining whether this plant is a true species is almost an exercise in futility. Germination of seeds produced by this plant has yielded a number of variations in leaf shape and growth habit, confirming that this plant is likely to be a natural or artificial hybrid. 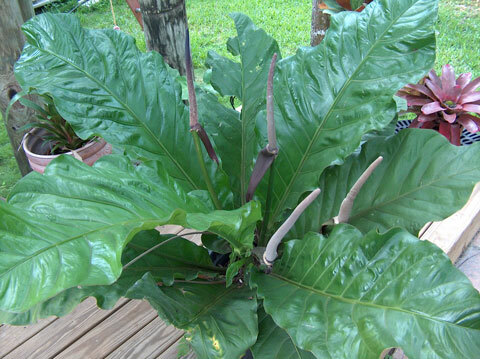 However, the overall look of the plant is indeed typical of the birdsnest group of Anthurium plants. My specimen produces bright red berries, while the true A. hookeri is reputed to produce white berries. Therefore, mine is likely a hybrid involving A. schlechtendalii as one parent.